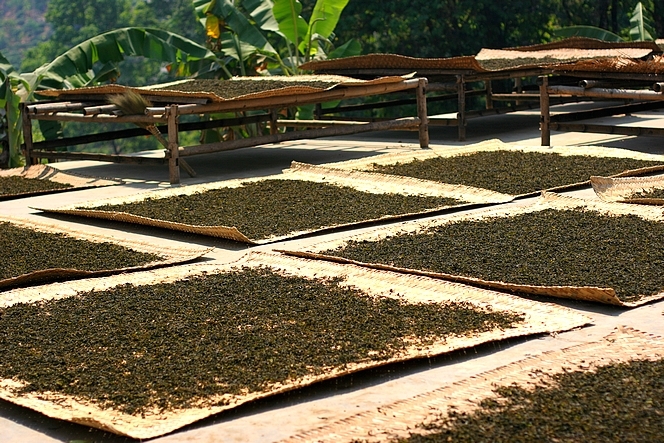 If you ever go to Xishuangbanna (I wish you to because this region of southern Yunnan (China), watered by the Mekong, offers landscapes of great beauty), you might see these mats set on the ground, on which tea is dried. This is the first step in the making of the famous Pu Er, both considered great for some, terrifying for others, because of its strong smell. Here however, it’s only the first stage of production: the leaves wither in the sun for 24 hours, giving off a delicious perfume. It’s only later, when the same leaves will ferment 45 days that their smell will change considerably. I’ll talk to you again later about it. Meanwhile, enjoy this Xishuangbanna I love, this Celestial Garden as they sometimes call it, with its mountains covered by jungle, its breathtaking gorges. It is both wild and calm. In this part of China, we can really breathe.